Click on the SchoolMessenger Attendance Portal button below to report student attendance. Order your own CHS gear today. myPass is an Alberta Education secure self-service website for Alberta students to access Alberta Education services such as View diploma exam results, register for diploma exams and order high school transcripts. Report cards will be issued tomorrow during TAP class to all students. Parent Teacher interviews are on Thursday this week. Then we will all enjoy the break! Saturday, February 9, 10 a.m. to 2 p.m.
Take a tour of the campus. Speak with a faculty member or a representative from an academic area of interest. Explore our wide range of academic programs, student services, and student activities and organizations. Apply on the spot - applications will be accepted, and the application fee will be waived to those who apply in person that day. Perspective students in Grades 10-12 (or graduated) who register and attend Open House are entered into a draw for a $1,500 tuition credit! Registration for Open House is open for students looking to register individually; students are encouraged to per-register. Terry Fox Humanitarian Awards are open to students of all abilities. 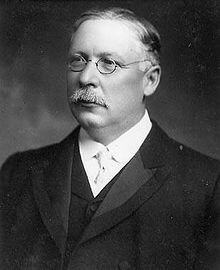 Canadian citizens or landed immigrants. Involved in voluntary humanitarian activities (for which they have not been compensated). Planning to or are already studying towards their first university degree or diploma at a Canadian post-secondary institution, or entering their 2nd year of CÉGEP in the upcoming academic year. Terry Fox Award Recipients are eligible to receive the Award until they graduate with their first university degree or diploma (for a maximum of four years), provided they maintain satisfactory academic standing and a standard of humanitarian work and personal conduct which, in the opinion of the Board of Directors, justifies the award. Applicants must provide three (3) referees and upload online an (un)official transcript detailing the applicant’s last two years of schooling (official transcripts, sealed by the issuing institution will be requested from applicants who are selected for an interview). Referees will be emailed a link requesting they complete an online Referee Form on behalf of the applicant. The online application, including all the accompanying documents, must be completed and submitted online by the deadline – before midnight. Applications and all documentation (including Referee Forms and unofficial transcripts) received after that date will not be considered, nor will they be held over for the next year. Some schools offer scholarships and/or other perks for applying early. 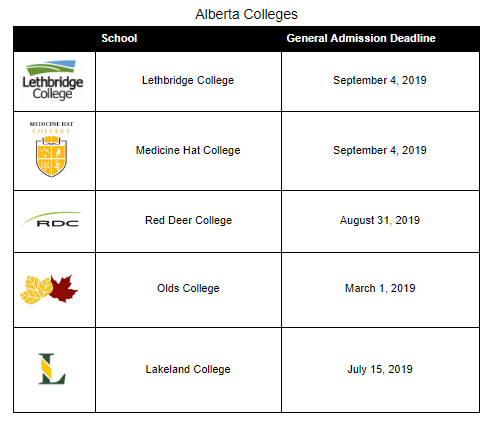 Please see the attached document(s) for application deadlines at the main Alberta colleges and universities. The Alberta and Canada governments provide student loans and grants to help you reach your post-secondary educational goals. 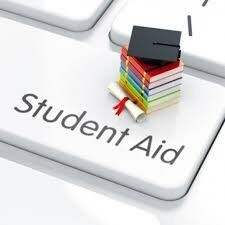 When you apply as a full-time student, you are considered for both Alberta and Canada student loans and grants. Financial assistance is also available for students studying part-time. Purpose: To recognize and reward academic achievement at the senior high school level and to encourage students to pursue post-secondary studies. Eligibility: Apply once your final official high school transcript marks are available and when you are enrolled in full-time post-secondary studies. 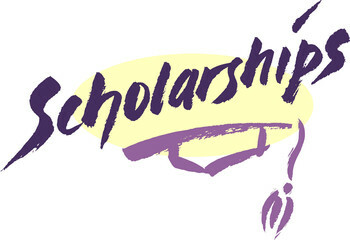 Anyone with averages of 75% or higher in any of Grade 10, 11 and 12 will recieve the scholarship. Make you sure you apply! 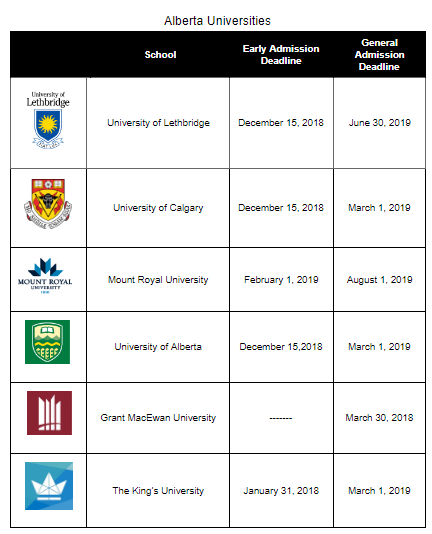 ApplyAlberta is an online application and transcript system that anyone can use to apply to undergraduate programs at one or more of Alberta's public post-secondary institutions.